Home » Snippets » Snippets: Top 9 Must Try Buffets in Singapore | Over-eat at the best! We love to eat. But am not a fan of overeating, that’s why we skip buffets most of the time. Still, it feels great to indulge once in awhile, don’t you agree? And if you do, just make sure you load the right calories – and as the title suggest, over-eat at the best! While not an exhaustive list, a dependable directory to some of the best Buffets in Singapore! Let’s be realistic too, it is almost impossible to come across a good buffet without paying it up. P.S. As with every list, this is done alphabetically (updated May 2016). Enjoy! Edge is also part of our list of 8 Sunday Brunch Buffets in Singapore you should not miss. Manhattan is also part of our list of 8 Sunday Brunch Buffets in Singapore you should not miss. Despite facing still competition from nearby hotels, Oscar’s at Conrad Centennial Singapore still remains one of the best for us in terms of its buffet quality. It may not be the largest or longest buffet line here, but we didn’t feel like we are missing out on anything after every visit. Highlights at Oscar’s are the seafood, Japanese sashimi, outdoor live noodle station which features local deights such as laksa and prawn noodle, and of course, the dessert station which carries Mövenpick ice-cream. The restaurant has recently revamped its Supercharged Sunday Brunch in April 2016. Oscar’s is also part of our list of 8 Sunday Brunch Buffets in Singapore you should not miss. Decked in bright colours, The Line at Shangri-La Hotel Singapore has been serving one of the most extensive buffet spread since, which will definitely excite any buffet-goers. With a sumptuous spread catering to meat lovers and one that is bound to satiate your seafood craving, there are also the cheese, foie gras, local Singaporean delights, Indian fare, and the list goes on. My favourite station was undoubtedly the carving station with 6 types of roast meats to choose from. With cuts such as the 48-hour Slow Roasted Wagyu Beef Leg with a Mustard Crust, the Australian Stockyard Tomahawk Steak, a 200-Day Grain fed Australian Stockyard Roasted Beef Striploin with Truffle Jus and well, you get the idea! The Line is also part of our list of 8 Sunday Brunch Buffets in Singapore you should not miss. 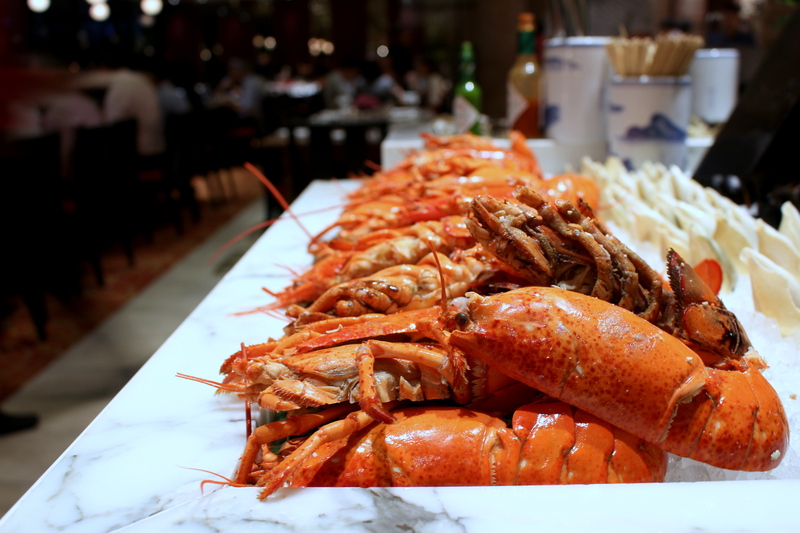 If you love dim sum, Yan Ting at The St. Regis Singapore runs a weekend dim sum brunch buffet. There are more than sixty dishes to enjoy from the menu, though it’s virtually impossible to try everything unless you have a dinosaur appetite, but we reckon that it’s best to come in a trio or party of four to try more dishes. From the Double-boiled Fresh Abalone Soup with Black Garlic to the Wok-baked Boston Lobster with Superior Stock, this is probably the only dim sum buffet I will return for again. Yan Ting is also part of our list of 8 Sunday Brunch Buffets in Singapore you should not miss.